New Zealand isn’t the most prolific TV drama-producing nation in the world. But it does have a good skills base and some fantastic locations (Jane Campion’s exquisite Top of the Lake miniseries was shot on the island, as were high-profile movies like the Lord of the Rings trilogy). The country also has a decent level of funding support from the government. Media funding agency NZ On Air invests around NZ$80m (US$56m) a year in local TV shows, of which NZ$36m is allocated to drama and comedy. This money is accessed by applications from broadcasters. Outrageous Fortune is a comedy drama that ran on TV3 from 2005 to 2010. The popular show followed the fortunes of a criminal family that decides to go straight. In 2014, TV3 greenlit a prequel called Westside, which also proved popular. Last year NZ On Air contributed NZ$7.5m towards a second season of the show. Both series are from South Pacific Pictures, which is one of the key players in the New Zealand business. It is owned by All3Media and also makes NZ’s iconic soap Shortland Street. The Brokenwood Mysteries is now into its third season on Prime. Comprised of two-hour murder mysteries set in small town New Zealand, the latest batch of four films received NZ$4m from NZ On Air. The franchise, produced by South Pacific Pictures, debuted in 2014 on Sunday nights and attracted 200,000 viewers, a strong performance for Prime. 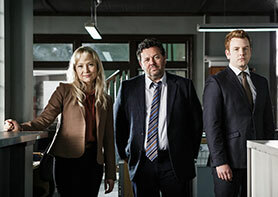 Dubbed as New Zealand’s answer to Midsomer Murders, it continues to do good business for Prime. Brokenwood has also been sold extensively on the international market by All3Media, rating well for public broadcaster France 3. Dirty Laundry secured NZ$6.8m in July 2015. The 13-hour drama for TVNZ’s TV1 is produced by Filthy Productions, the same company that made Filthy Rich. The show centres on a middle-class family whose mother is jailed for money laundering. It is written and produced by Rachel Lang, Gavin Strawhan and Steven Zanoski. A trailer was released in April 2016, but Dirty Laundry is not due to launch until later this year. The show is sure to receive the same close scrutiny as Filthy Rich. Hillary is the story of famous mountaineer Sir Edmund Hillary, based on the biography by Tom Scott. Produced by Great South Television for TV1, the six-part series received NZ$6.4m in 2014. Given the subject matter, it stands a good chance of being picked up by broadcasters around the world. The show has already been acquired by Network Ten in Australia. Bombshell – The Sinking of the Rainbow Warrior is a two-hour TV movie about the infamous sinking of a Greenpeace boat. It is from Screentime for TV1 and received NZ$2.8m in July 2015. TV movies based on true stories are an important part of the funding programme, with NZ On Air also backing Jean, about the NZ aviatrix Jean Batten. “Each of these is unique to New Zealand. Seeing our own stories on screen, whether they are fictional or bring our history to life, is crucial to our culture. Amid a sea of foreign content, this is New Zealand on air,” said Wrightson. Produced by Lippy Pictures, Jean secured NZ$3.2m. The Cul De Sac is a dystopian teen drama about a world in which adults disappear. Produced by Greenstone TV for TV2, season one secured just over NZ$1m and season two was granted a further NZ$1.4m in May this year. The sci-fi themed show is a relatively new genre for NZ. Aired on Sunday nights at 18.00 from April 2016, it seems to have had a good first outing. Step Dave is another South Pacific show. Season one received NZ$6.6m and season two got a further NZ$6.8m in 2015. It sees central character Dave, a 24-year-old Kiwi slacker, face major life changes when he falls in love with Cara, an older woman with three kids and “baggage.” In an interview with NZ On Air, series creator Kate McDermott said this about writing for Kiwis: “NZ audiences are made up of a lot of different types of people, all with diverse preferences and likes. (But) what I’ve noticed is that viewers seem to quite like spending time with down-to-earth Kiwi characters they can recognise or identify with. Humour also seems to be important. I don’t think we like to take ourselves too seriously, so even in moments of high drama, suspense, romance, danger, we always try to find room for a saccharine-cutter.” The TV2 show attracted 189,000 viewers to its finale in November and there is no decision yet on whether it will return.